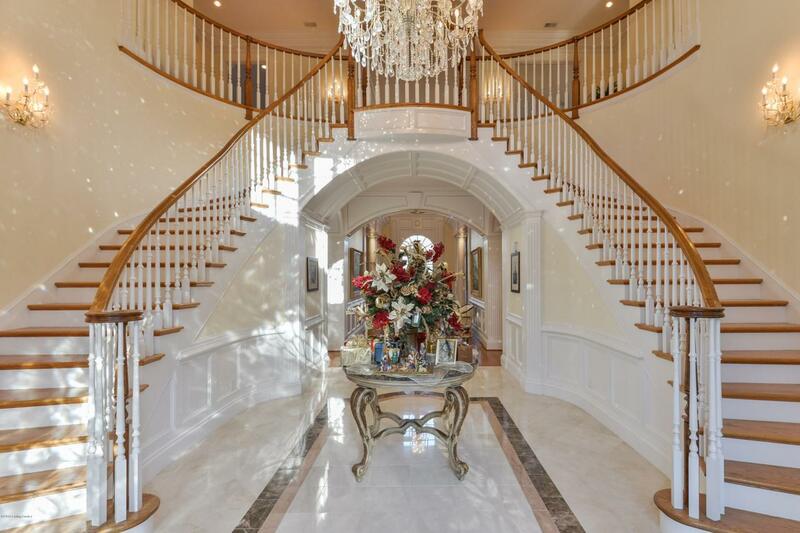 This elegant estate is nestled atop nearly 5 lavish acres in exclusive Glenview. The custom built home is the perfect blend of classic elegance featuring stunning architectural details with a modern floor plan and amenities. 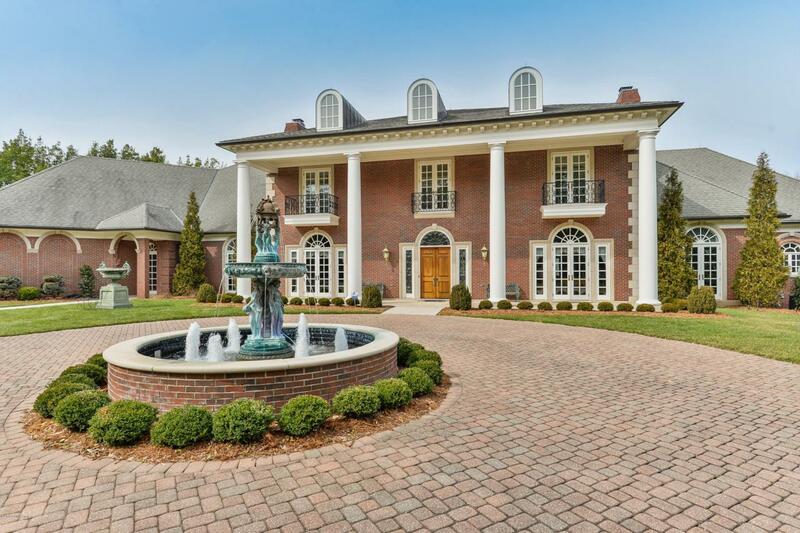 Guests are greeted by an impressive circular drive entrance and striking fountain from Italy. Double mahogany front doors lead you to the two-story foyer which showcases a sweeping double sided grand staircase, luxurious marble floors, ornate crown moldings and striking crystal chandelier. The spacious foyer is flanked by a formal banquet size dining room to the left which features another beautiful Shoenbeck crystal chandelier, and a cozy fireplace which makes it the perfect spot for holiday hosting. The formal living room is on the opposite side of the foyer and isadorned with beautiful custom bookcases another elegant fireplace, intricate moldings and both rooms surrounded by beautiful Palladian windows, French doors and intricate inlaid hardwood floors. The living room opens up to the large and welcoming great room with another cozy wood-burning fireplace, beautiful classic coffered ceiling, and panoramic views to the picturesque backyard with timeless Indiana Limestone patio and beautiful pool. The great room is also conveniently open to the gourmet kitchen with custom cherry cabinetry designed by Mike's Woodworking, classic Black Galaxy granite countertops, a convenient breakfast bar, a functional center island, a walk in pantry, a built in buffet for informal entertaining, and an expansive planning desk with china cabinets above, a bar and wine cooler. The breakfast area is perfectly situated with more striking views of the lush lawn and landscaping and a relaxing spot to view the pool fountains. The opposite end of the kitchen leads to a charming sun room with octagonal vaulted bead board ceiling, and another inviting fireplace. The complete back of the house is open and offers multiple sets of French doors which allow the perfect flow for entertaining family and friends. From there, a back hallway leads to a second half bath, the oversized laundry room with plenty of built-in cabinetry and access to the spacious four car garage, also with more built in storage. This wing also offers a charming guest bedroom and private ensuite bath. 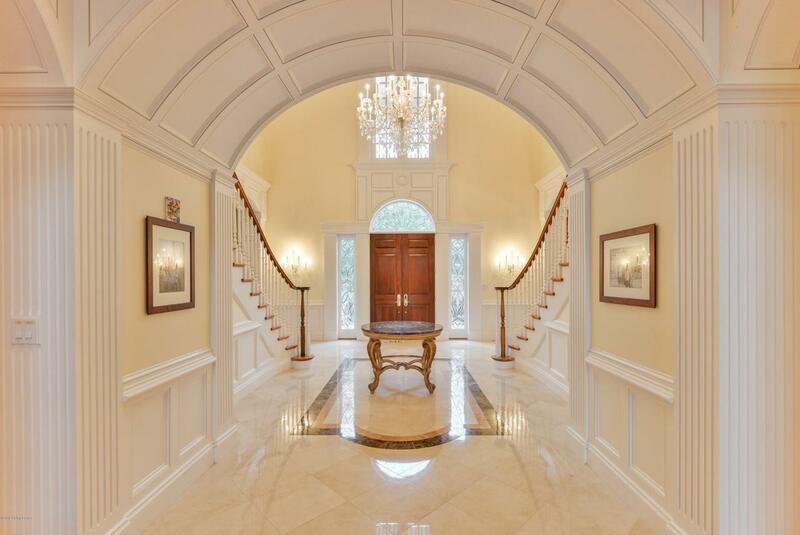 Both hallways off the foyer showcase beautiful barrel vaulted ceilings custom painted by a local artist. The secluded master suite is at the opposite wing of the house for optimal privacy. Before entering you are greeted by a beautiful artwork niche which leads to a private sitting room (which could also be a separate bedroom.) The spacious master bathroom features separate vanities, his and hers closets which are all surrounded by classic granite and marble. The spacious master bedroom offers more French doors for private access to the limestone patio, covered porch and pool. Up the sweeping staircase, the second floor features a large bedroom to the right with a full ensuite bath and a charming spacious sitting room adjacent with another inviting fire place. The opposite wing includes two additional bedrooms and their two full ensuite baths, all of which are finished with classic granite and marble. There is a full second kitchen with more granite countertops, another breakfast bar, a game room with pool table, another half bath, exercise room and another family room with charming creekstone fireplace. Other features of this beautiful estate include 6 Bedrooms, 7 full baths and 3 half baths, 12 foot ceilings, 5 HVAC systems, inlaid hardwood floors, ornate crown molding, fluted doorways, pool with fountains, pool room with full bath, new landscaping and exterior lighting, convenient and charming French doors surround the house offering access to the exterior for entertaining, Indiana Limestone, copper gutters and downspouts, automatic timers for indoor and outdoor lighting, automated window blinds, whole house generator, lawn irrigation system and alarm.